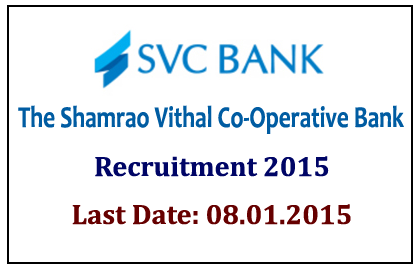 The Shamrao Vithal Co-Operative Bank announced recruitment for the post of Divisional Manager. Eligible candidates can apply for this post within 15 days (08.01.2015). More details regarding this recruitment were given below. Manage and Guide the team of Branch Managers to reach business goals and targets. Candidates those how possess the above eligibility can apply for this post by sending their application and detailed resume along with passport size photograph to the email:hrms@svcbank.comwithin 15 days.